Being an event coordinator is a great opportunity to express your creative flair, so here are two event coordinator cover letter examples to help you create your own. Event coordinators are responsible for every facet of events and meetings. They collaborate with clients to plan all the details and get an overall vision of what the client is looking for. They are also in charge of scouting and booking locations, food, staffing, entertainment, and clean up. Being an event coordinator is a demanding, but highly fulfilling job. Klipsten Event Planning & Co. I am writing to show my interest in the event coordinator position you have available at your company. I was referred to you by your recently retired employee, Mr. Arnold Milway, as he would highly recommend me for this position. I am a graduate of Nevada State College, and hold a double major in communications and public relations. The description for this job parallels my qualifications and passions perfectly, and I know with my seven years of comprehensive event and customer service experience, I have a lot of good things to offer your business. I am currently employed as a Special Events Manager with McRenolds Events, and have been benefiting this company for the past five years. My main responsibilities include managing a variety of events, budgets, deadlines, schedules, and programs for a diverse demographic of people. I am in charge of coordinating an array of events, including formal luncheons, legislative breakfasts, large scale picnics and cookouts, conferences, and tournaments. I am also responsible for the marketing and advertising aspects of the events. During my time with McRenolds Events, I have had the opportunity to move up the career ladder through promotions. I am proud to say that I started as an intern with the company, and was offered the position of special events manager within two years. Additionally, I have been able to build a solid foundation of trust, which has allowed me to form strategic partnerships with clients, venues, and service providers. I was also voted Employee of the Month four months in a row while working there. Not only do I have the fundamental education to be successful in this position, but I also have excellent interpersonal skills and extensive experience in customer service. Having worked with a diverse population, including executives, volunteers, and organization members, I am a well-organized person, and self-motivated when it comes to getting things done. I am also well accustomed to working after hours and on weekends, as I know it is necessary in this particular career field. I know you’ll find that my high energy and positive personality is what has allowed me to work well with others, while still maintaining an impressive work ethic. Being confident in my passion for event coordinating is what makes me a successful worker. I believe we could both benefit from a long-term collaboration. I look forward to discussing my qualifications with you in person, and I thank you for your time and consideration. I am writing to express my interest in the event coordinator position you have posted on your company’s website. I am a graduate of The University of Nevada, Reno. My degree is an honors degree in Hospitality, with a focus on Special Event Planning. The education I have received, in combination with several years of experience in event managing, has given me valuable insight into the overall aspects of event planning, and I wish to bring my expertise to your company. While I enjoy working at my current employer, The Big Day Services and More, I have found that my true passion and interests lie on a different path. I believe joining a full-service event management company, such as yours, aligns with my desires and interests. My daily tasks at my current workplace include researching different venues, budget management, staff training, negotiating contracts, and reporting outcomes. I characterize myself as a quick problem solver and a team player that works well in a fast-paced environment. Through my experiences, I have learned a lot about time and task management, as well as forming relationships. At my current job, I have maintained one of the top quotas for bringing in new clients. Additionally, I have received numerous customer compliments, and hold the highest rate of returning customers. For my superiors, I was a reliable source of support at all times. I understand that every company is different, but I know my interpersonal skills can easily adapt to your standards to produce similar results. From leveraging media and marketing outlets to managing multiple projects and deadlines, my highly effective communication skills are what set me apart and have given me a solid foundation in this business. While I consider myself a self-starter, I am also a team player, always ready to offer innovative and original ideas. I understand the value of goals, and I strive to go above and beyond expectations. I am an extremely organized person, which is one of the most important skills someone in event organizing should have. I enjoy putting together an event from start to finish. I believe your organization fits perfectly with my field of expertise. My creativity will work to enhance your already well-known events, and bring them to the next level. At the same time, I would strive to bring your company new events. I would like to work for a company where I can further develop my skills as well, such as yours. I would appreciate the opportunity to further discuss my candidacy with you in person, and I look forward to hearing from you soon. 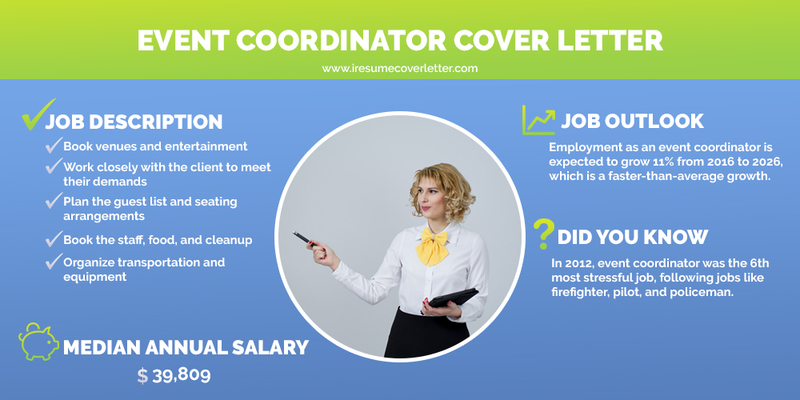 The job of an event coordinator is demanding, so be sure to highlight your skills in organization, communication, and relationship building in your event coordinator cover letter. Potential employers will be more inclined to pay attention to you if you show a successful track record of working events, so it’s also a good idea to include any past experiences related to this field as well. What else would you include in a cover letter for event coordinator positions?